Man, this movie looks great. For a character who’s fictional, Spider-Man has had a pretty great year. The Spider-Man PS4 game is beloved by both heartbroken lovers and delighted New Yorkers alike, his comic book just had an end to two legendary runs by both Brian Michael Bendis on Miles Morales and Dan Slott on Peter Parker’s main title “The Amazing Spider-Man”, and now comes this — the Miles Morales starring movie, Spider-Man: Into the Spiderverse, written by Phil Lord, Chris Miller (of Lego Movie fame) and Alex Hirsch (of Gravity Falls fame, of course). (Note – Lord is the only one credited with the screenplay, proper.) 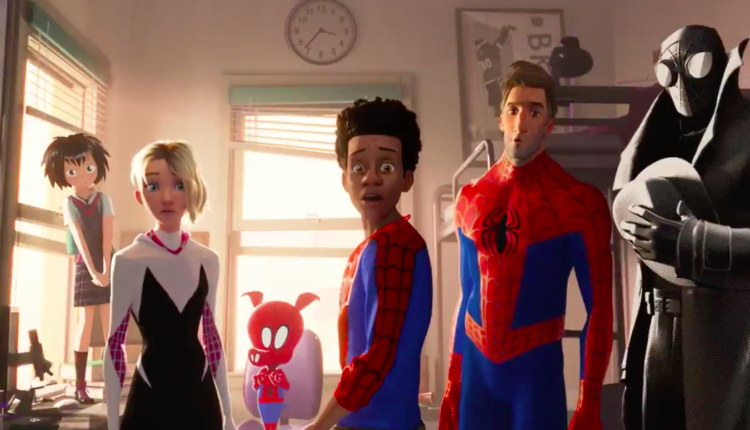 And now, after a few trailers heavy on mystery, we have a new one with all the bells and whistles — the stop motion style CGI animation, the incredible villains, set pieces and mind bending plot, and most importantly, John Mulaney as Peter Porker, aka, The Spectacular Spider-Ham. The trailer’s opening seems to share a lot with Lord and Miller’s other big weird superhero CGI animated movie, Lego Batman. Here, Peter Parker, played by New Girl’s Jake Johnson, is a celebrity akin to the fictional Spider-Man in our universe who, along with being a veritable hero, is also a heavily merchandised character along with cereal (Spidey-O’s), a comic book series (‘True Life Tales of Spider-Man’, because in this universe Spider-Man is real) and a Christmas Album whose incredible song list I’ve screenshot so you can marvel (wink) at it below. The movie however belongs to the other Spider-Men — and in particular Miles Morales. Created by Brian Bendis and Sara Pichelli, Miles Morales undoubtedly garnered an good amount of new fans after his meaningful appearance in the Spider-Man PS4 game where you looked for medicine and found corpses as Peter Parker swung around being goofy and fighting bad guys. Here he is played by Shameik Moore, and his father, Jefferson Davis, is played by Bryan Tyree Hill (Paperboi from Atlanta) and his uncle, the corrupt Aaron Davis, is played by Academy Award winner Mahershala Ali. There are other Spider-Man too. Nicolas Cage plays Spider-Man Noir, the Spider-Man from a universe where everything is sort of black and whitish, the morals are corrupt and everything reminds you of a Raymond Chandler novel from the 1940’s. Plus, we get the premiere of the anime inspired Peni Parker and her mech suit SP//dr, created by My Chemical Romance’s frontman Gerard Way for the comics way back when. All that, and Hailee Steinfeld as Spider-Gwen, from the universe where Peter Parker’s late girlfriend Gwen Stacey became Spider-Man. Look, it’s going to be great. But nothing on this list is more important to me… than that damn Spider-Pig. Peter Porker. I salute you. What did you think of the trailer? Let us know in the comments or on Twitter at @WhatsTrending.